Cebu Food Crawl 2018 - I've been a loyal foodie and participant of this annual "food crawl" here in Cebu. It's now on its 4th edition. Of course, the organizing team is no less than the premier blogging group of the Queen City of the South, the Cebu Bloggers Society. This year's theme is "Sustainable Dining". 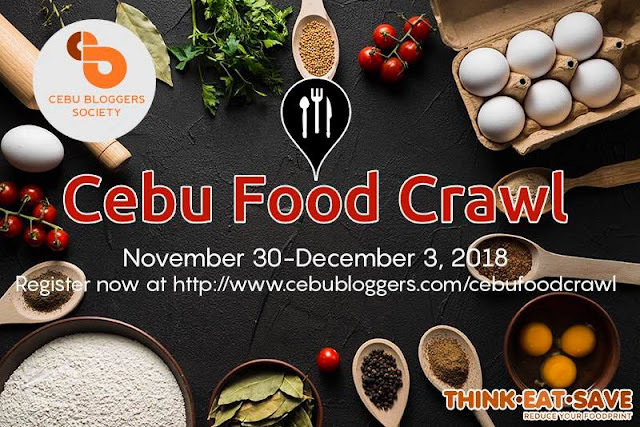 It will be a four-day gastronomic endeavor participated by food bloggers and influencers all over the Philippines with guests coming from Luzon, Visayas and Mindanao. The said event would like to support the Zero Food Waste lifestyle. For a more up close and personal update, catch me up on my Instagram (@Xerendipity1) and Facebook Page (Hershey Kisses) from November 30 to December 3, 2018 as the group (food crawlers) would hop from one dining place to another across the cities of Cebu, Mandaue and Lapu-Lapu.